As I didn't do a outfit post yesterday I thought I'd do one today, even though I wore this outfit the other day but Im also wearing it today? Confusing! Anyway, Its pretty simple. I bought the infamous Disco Pants the other day, mainly because I they actually fit this time I put them on. When I first tried them on the medium wouldn't fit, then the second time they fit but I wasn't happy with them still. I tried on the small on a whim a few days ago when I was on Oxford Street (I wasn't supposed to be shopping so oops!) and they fit do I decided to get them. Im not really one for fitting into something justifies the buying of it, but I thought I'd treat myself. I never ever ever ever wear trousers, I don't think there has been a single post since I started this blog where I have worn them. Yet I really like the Disco Pant. They are as flattering as people make out and as versatile as you want them to be! Of course to do with my new Disco pants I had to buy a new top to go with them. As I don't normally like the idea of my crotch being out I wanted a baggy tee to just throw over them that still covered my enough to make me feel comfortable! I bought this neppy style tee from Topshop in a size 14 as it looked like it would have the fit I wanted! Then I just threw on some comfy shoes (I was at press days all that day) and the usual jewellery and done! Simple, easy outfit. Love the shirt with the disco pant's. I really want to finally cave in a buy a pair, they look so nice on everyone! loooove the pants. i really need to pick up a pair and i love how the glitter only our nails mimic your shirt! well done on teaming it up with a long tee! I love this outfit! I don't find the crotch area of Disco Pants too flattering, so the oversized tee looks really great with them. I've been wanting to buy that necklace for the longest time too. It's gorge! i feel the same, they are a bit too tight, but then again i think skinny jeans are the same and the crotch area is on show when you wear those! and almost everyone walks around with their crotch exposed in trousers! I dunno! i just feel like I'm letting too much hang out haha! not used to it at all! LOVE this outfit! 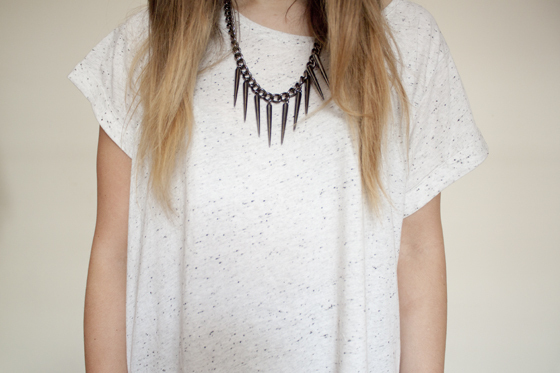 The necklace, nails and tee are so beaut. thanks! they are fake unfortunately! i think so! i feel so self concious with it out! i don't know why i find it so odd as I can wear shorts and not feel weird about it! its up to you at the end of the day! yeah they are longer but i rolled them up as I'm quite short and they are way too long for me! 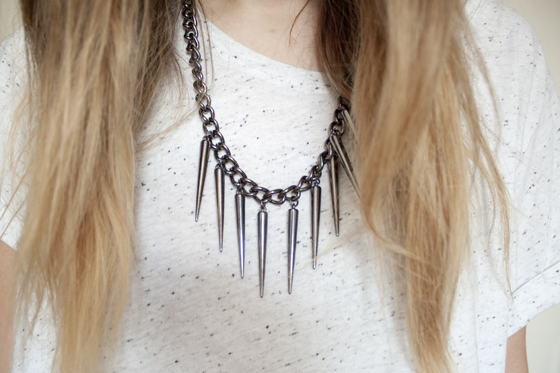 Love that outfit, the necklace looks great too! They look great together and I love the shoes, might have to check these out next time I'm doing a food shop! I literally just got in from exchanging mine, as they laddered right on the bum! However, I live in them so there was no chance of me not getting another pair. Mine are slightly too short though, but I love the high waist on them, which totally makes up for that. They look fab with this tee too! I love this! I love how you dress up a simple outfit, the disco pants are gorgeous and I love speckled t-shirts! The most simplest outfits are the best outfits! I love your necklace, it goes so well with the t-shirt. I love the shirt, its really simple, yet there is something about it, that just looks perfect, I think it is the black speckled look too it. love this outfit! effortless but effective. I need disco pants but I'm having to wait until I can justify buying them :( they look amazing on you! i'v been wanting the disco pants for ages! but i think it's the price tag that puts me off! ive been wanting disco pants for ages but cant bring my self to pay £70 would you say there worth it? I finally bought the disco pants a few weeks ago and I'm so glad I did. They are worth every penny! Look lovely on you and I love the t-shirt too.. surprisingly quite cheap for TS! those nails are super cute. Hi Lilly, I Love your blog, i follow it every day. I just started my blog take a look. Also where did your ring from with the 3 turqiouse stones? Classic white and black combo. simple yet chic! 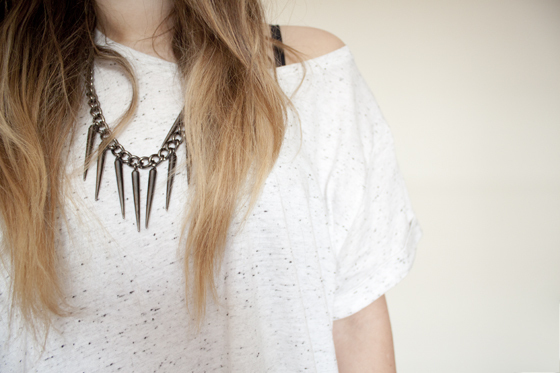 I love the shirt, it´s simple but great! I really love that top! And your nails are beautiful! Everytime I see someone rocking the disco pants I want them, and this is no different. I am the same and don't like the idea of throwing my crotch around in public so I like the look you have got going on here with a baggy tee as it makes them that tad more wearable. Silly question for an outfit post but what foundation are you wearing? By the sounds of things we have verrry similar skin tone and I cannot for the life of me find a good one. amazingggg pictures, so effortless but effective. 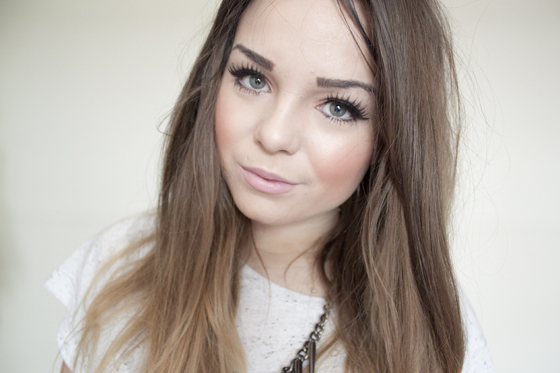 and i love the dip dye youve done with your hair too! Gorgeous outfit, I really want some disco pants - all you bloggers are making them so tempting!